Audience/Genre : Adult/Romance, Chicklit, Women's fiction. Publication : May 15th, 2012 by HarperCollins Publishers. If you had to describe Arranged in 3 words, what would they be? First Spin and now Arranged, both with unique plots, what inspired the story of Arranged? Thanks! I know a couple of people who have had traditional arranged marriages and I always wondered what really made them do it. One day I asked myself whether anyone would use an arranged marriage service if they hadn't been brought up in that tradition. And I couldn't get the idea ought of my head. Why the Anne of Green Gables reference? Any particular reason? When I tried to imagine someone who might use that kind of service I thought that it might occur to someone who started out with such a romantic idea about love, a fateful idea, and had had it crushed one too many times. One way that people become like that (I think) is that this is what happens in books. I love the Anne books, and in part I love them precisely because they have a made-to-be love story in them. But like Rob asks himself in High Fidelity: are you sad because you listen to sad songs, or do you listen to sad songs because you're sad. Are people hopeless romantics because of books or is it the other way around. Anywho, as part of exploring that idea, I decided to up the ante and have the main character be named after Anne. So she couldn't help being drawn to that fairytale kind of story. What's your take on arranged marriages? Do you think they work? Like any marriage, I think some of them do, some of them don't. I think it depends on what you expect from it, and how you work on it. What kind/genre of books do you enjoy reading? I have very eclectic tastes: I read detective fiction, non-fiction, history, novels. Some of my favorite authors are: Jane Austen, Nick Hornby, Bill Bryson, David Sedaris, James Frey, Audrey Niffenegger and Shawn Klomparens. I confess to having an odd weakness for The Lake House. Don't laugh at me. Is there a book/movie quote that you love? What is it? The scene from The Princess Bride that I quote in Spin: "Never start a land war in Asia." I also can quote large parts of Bull Durham and High Fidelity (and frequently do). It's a tie between Cabo in Baja California, Mexico and Jackson Hole, Wyoming. Neither can be beat for breathtaking beauty. And I've been lucky to spend a lot of time in both places. Vanilla. It sounds so boring but I LOVE vanilla ice cream. If Arranged was made into a movie, who do you think should play Anne and Jack? Honestly, I have no idea! And on the off chance it ever gets made into a movie I don't want to have a fixed idea. That was fun! If you haven't already read Catherine's books Arranged or Spin, do so immediately, I love her books! 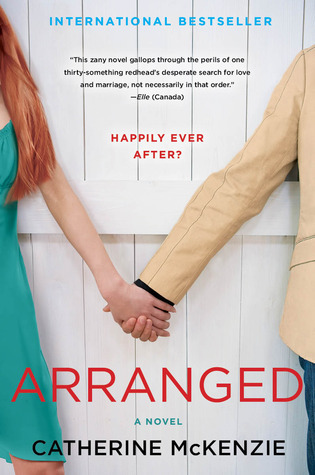 Check out my review of Spin and Arranged if you'd like :) Okay now it's giveaway time! Winner has 48 hours to respond, or a new one's chosen. It's the publisher's responsibility to ensure that you get the book, I'm in no way liable/responsible. That would be Gallagher Series. Love Sophie Kinsella books. Yep, friendship can lead to marriage. Fav movie - 50 first dates. Adorable! I like Sophie Kinsella or the Bridget Jones series. Love the Bridget Jones movies! I do believe friendship can turn into marriage. It probable helps & makes it stronger. The book sounds great and I can't wait to read it! Not sure about chick lit, my husband calls everything I read chick books...I kinda consider the very femanine contemporary chick lit. In that case I love Bella Andre's Sullivan series. It's not as manly as say Jaci Burton's Play by Play series which I adore because I am a sports fanatic! I love all Sophie Kinsela books... I love it in books when friendship turns to love, but trust me, I hate it when the same happens in real life! Have lost many a good friends that way! My favorite romantic movie has got to be Titanic! I've actually just started with chick lit, but I do love romance, so maybe I've been reading it all along and I didn't even know it! I love Suzanne Elizabeth Phillip's chick lit books! And I do believe that friendship can turn to romance as hubby and I are living proof of that! My favorite romantic movie is Casablanca! I can't pick one favorite chick-lit book....but love Emily Giffin and Sophie Kinsella. I think friendship is the best way to lead to love! You have to be friends with the person you love, because you need to have someone to support and depend on when you need it! I love books by Emily Giffin, not sure I can pinpoint a certain book, I've read a lot. I know friendship can lead to love, my hubby and I are proof :). My favorite romantic movie is How to Lose a Guy in 10 Days. I really enjoyed Liar's Guide to True Love by Wendy Chen because it balanced the romance and the heroines journey, PERFECTLY!! sometime chic-lits tend to focus more on one or the other and since I like romance more, I appreciate equal balanced book or books who lean towards to the romance more! my favorite chick lit would have to be anything by meg cabot or jennifer weiner. i think that friendship could definitely lead to love. and hopefully if you fall in love first, you'd end up being friends. my favorite movie i think would have to be either say anything or mystic pizza. (i guess i've got some 80s movie love going on today). This sounds like a good book. I am adding it to my tbr list and look forward to reading it. I really enjoy Jill Mansell's books. I don't read much chick-lit, however, I tend to watch a lot of chick movies. I've recently saw Friends with Benefits and enjoyed it. My favorite romantic movie would have to be P. S. I Love You. I think friendship can definitely lead to love. The person you love usually ends up being your best friend. So why not start that way. I don't have one favorite chick lit, but I love Janette Rallison. My favorite romantic movie is Sense and Sensibility, and I definitely think friendship can lead to love! I think friendship can lead to love and my favorite romantic movie is the Kiera Knightly's Pride and Prejudice movie. Thanks for the great giveaway! My favorite chick lit book is Every Boy's Got One by Meg Cabot. I definitely think friendship can lead to love. My favorite romantic movie is How to Lose a Guy in 10 Days. I love Emily Giffin (Something Borrowed & Something Blue) are my favorite. I totally thing friendship can lead to love. And my favorite romantic movie is The Notebook.